Gov. Jerry Brown, flanked by his attorney general and air quality chief, issued another demand on Friday that the Trump administration abandon its plan to freeze auto emission standards and revoke California's right to set its own rules. "It's important to shout it out," said state Attorney General Xavier Becerra, raising his voice against the backdrop of Interstate 5 in Sacramento, "that this is high-stakes poker." Calling President Donald Trump a "one-man demolition derby," Brown told reporters that the future is in electric vehicles, a development race the U.S. risks losing if the Trump proposal goes through. "This Trump administration attack on innovative technology jeopardizes the health of millions," shouted Brown, as 18-wheelers roared past, spewing diesel exhaust. State officials, along with attorneys general from 20 other states, also released their 415 pages of comments on the proposal, which Trump appointees have dubbed the SAFE Rule, for Safer Affordable Fuel-Efficient Vehicles, calling it "riddled with errors and based on faulty assumptions, incorrect modeling, cherry-picked data and a fundamental misunderstanding of consumer behavior." Today's announcement was hardly the first shot fired in this battle. California and 17 other jurisdictions have had a lawsuit pending against the SAFE proposal since May. The plan would freeze fuel economy standards for cars and light trucks in model years 2021-26, rather than the current schedule that calls for a gradual increase in fleet average economy, nominally to about 50 miles per gallon. "We're prepared to do everything, including a lawsuit, to make sure we defend the nation's clean-car standards, not just California's," state Attorney General Xavier Becerra told KQED's The California Report. "Just because they've decided to ignore facts and science, doesn't mean we're going to stand by and let the federal government have its way." State officials have supposedly been in negotiations with EPA over the plan, but Mary Nichols, who heads California's Air Resources Board, told reporters that federal officials have not moved at all off their intent to revamp the rules. 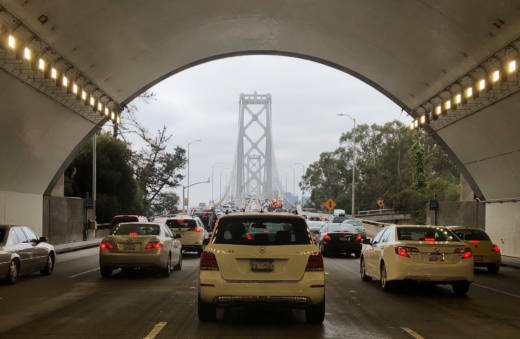 California, which has set its own standards for auto emissions since the 1970s, negotiated a compromise with the Obama administration that created a single national standard, something that automakers much prefer. Most carmakers have backed off of their initial support for the Trump rule, prompting Nichols to call it the rule that "nobody's asking for." The state is counting on the current escalating standard for auto emissions and fuel economy to meet its ambitious goals for cutting greenhouse gas emissions. Cars and trucks are the single largest source of global warming gases in the state, and those emissions have been on the rise of late, despite the tightest restrictions in the nation. In its Draft Environmental Impact Statement for the proposal, National Highway Traffic Safety Administration, which is jointly drafting the rule with EPA, acknowledged that the climate is warming rapidly. The draft projected a rise of about 7 degrees Fahrenheit in global temperature by 2100, but justified relaxing emissions rules by claiming it would make little difference in the pace of warming.